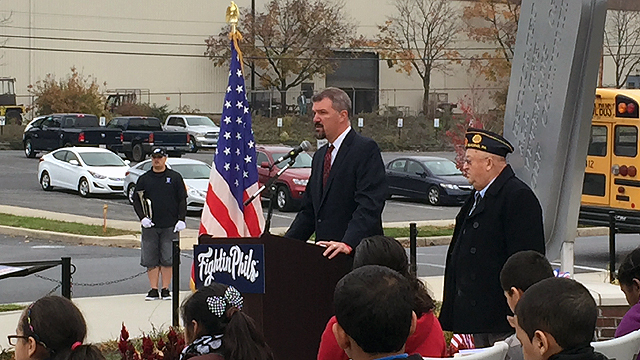 (Reading, Pa) – The Reading Fightin Phils have announced schools can register for the Capital BlueCross “Live Fearless” Outstanding Students Program this season. There is absolutely no cost to the school to participate, and in fact the school receives money through the program. The Capital BlueCross “Live Fearless” Outstanding Student Program is a unique incentive-based program designed to recognize and reward hard-working students. Each school decides their own method of distributing the tickets to their “Outstanding Students”. Through the program, the students are given an opportunity to celebrate their achievements with their families at a designated Fightin Phils home game. Each student recognized by their school as an “Outstanding Student” receives two FREE tickets to a Fightins game, receives an Outstanding Student Medal from a Fightins player, and gets to high-five the Crazy Hot Dog Vendor and has their photo taken with him during a special pre-game Outstanding Student Ceremony. For each free ticket that is used, and for any additional tickets that are purchased through the Capital BlueCross “Live Fearless” Outstanding Student Program, the participating school receives $1 back. In 2016, as part of the Capital BlueCross “Live Fearless” Outstanding Student program, the Reading Fightin Phils donated $3,073 back to participating schools in the club’s surrounding community. 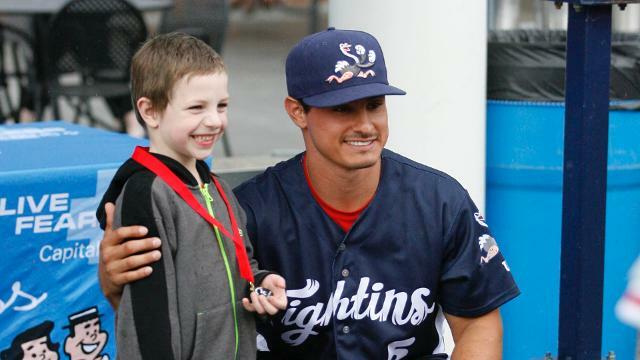 The Fightins hope to donate even more money to schools during the 2017 program. The more schools that sign up for the Outstanding Student program, the more money that the Fightins can donate to those schools. With the funds received, schools will be able to support students’ needs and contribute to the educational process. The Capital BlueCross “Live Fearless” Outstanding Student Program is extremely easy to sign up for, and again, it is FREE for the schools. The person that signs up can be a school teacher, administrator, or PTO/PTA representative. Schools can sign up now for the 2017 season by contacting the Fightin Phils Director of Educational Programs, Music, & Game Presentation Todd Hunsicker at 610-375-8469 x.206 or by e-mail at thunsicker@fightins.com. Dates are available in May. The program is easy to implement, and your school receives a check from the Fightin Phils. 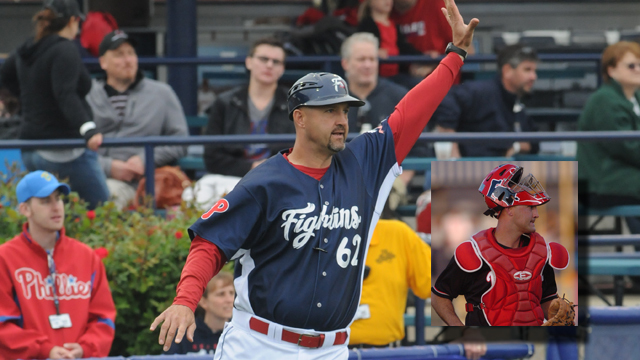 (Reading, Pa) – The Reading Fightin Phils have announced that 2016 Reading Baseball Hall of Famer Eric Valent and 2017 Reading Baseball Hall of Fame Inductee Mike Spidale will host baseball camps at FirstEnergy Stadium for youth baseball players this season. Fightin Phils players will assist Valent and Spidale in hosting the camps. The Fightin Phils Baseball camp hosted by 2017 Reading Baseball Hall of Fame Inductee, and two-time Fightins Team MVP Mike Spidale gives kids the chance to interact and play with Fightin Phils players with three days of instruction by Fightin Phils players and leading baseball coaches from around the area. 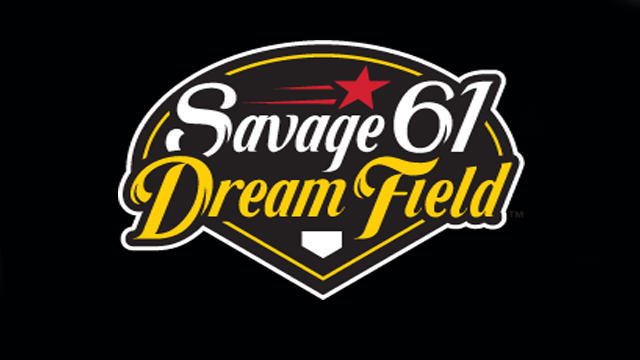 In addition to the chance to work on their baseball skills on the perfectly manicured field here at America’s Classic Ballpark, each participant will also receive a Fightins Baseball Camp T-shirt and two tickets for a Fightin Phils game. At that game, the campers will be honored on the field before the Fightins game. There will also be an autograph session with Fightin Phils players as part of the camp. You can sign up as an individual, or you can sign up as a group. If you sign up as a group (group can be as small as two campers), not only do you receive a group discount, but you also guarantee that your group will be bundled together as they move from station to station throughout the camp. Bring the whole team, or a group of friends, and the Fightins will guarantee that you are in the same bundle of campers for the entire camp! The Spidale Fightins camp is limited to 125 campers and boys and girls from the ages of 7-14 can attend. The camp will run from 9:00 a.m. until 12:00 p.m. each day. The first Spidale Fightins camp will be from Tuesday, June 20th through Thursday, June 22nd. Campers who attend this session will receive two tickets for the Reading Fightin Phils game on Thursday, June 22th at 7:05 p.m., and will be honored on the field prior to the Fightins game. The second Spidale Fightins camp will be from Tuesday, August 1st through Thursday, August 3rd. Campers who attend this session will receive two tickets for the Reading Fightin Phils game on Thursday, August 3rd at 7:05 p.m., and will be honored on the field prior to the Fightins game. For the seventh straight year, former major leaguer and Reading Baseball Hall of Famer Eric Valent will be hosting the Reading Fightin Phils Fun & Fundamentals Baseball Camp The camp is designed for YOUNG players to have Fun, and learn some Fundamentals. During the camp, kids will receive on-field instruction from Eric Valent and Fightin Phils players, participate in fun baseball activities followed by a medal ceremony, autograph session and pizza party lunch with Fightin Phils players. Campers will also have access to Phunland following camp as well. Each camper will receive two tickets to attend the Fightin Phils game on their final day of camp. The Valent Fun and Fundamentals Camps are one-day camps, but please feel free to sign up for both days if you would like. The first camp will be Thursday, July 20th. Boys and girls ages of 5-8 can attend this session. The camp will run from 9:30 a.m. until 12:30 p.m. The second camp will be Friday, July 21st. Boys and girls ages of 4-6 can attend this session. The camp will run from 9:30 a.m. until 12:00 p.m.
Like the Spidale Camp, with the Valent Camp you can sign up as an individual, or you can sign up as a group. If you sign up as a group (group can be as small as two campers), not only do you receive a group discount, but you also guarantee that your group will be bundled together as they move from station to station throughout the camp. Bring the whole team, or a group of friends, and the Fightins will guarantee that you are in the same bundle of campers for the entire camp! As part of the Capital BlueCross “Live Fearless” Outstanding Student program, the Reading Fightin Phils have donated $3,073 to participating schools in the club’s surrounding community. Schools will be able to support students and contribute to the educational process with the funds donated through the program. Below is a list of the 32 schools that have participated in the program. The Capital BlueCross “Live Fearless” Outstanding Student Program is a unique incentive-based program designed to recognize and reward hard-working students. Through the program, students are given an opportunity to celebrate their achievements with their families at a designated Fightin Phils home game. Each student who participated in the program during the 2016 season received two tickets to a game, a pre-game meet-and-greet with a Fightin Phils player, individual recognition during a pre-game ceremony, and an Outstanding Student medal from the Crazy Hot Dog Vendor. The Capital BlueCross “Live Fearless” Outstanding Student Program is a five-year program that runs through the 2019 season. Schools can sign up now for the 2017 season by contacting the Fightin Phils Director of Educational Programs, Music, & Game Presentation Todd Hunsicker at 610-375-8469 x.206 or by e-mail at thunsicker@fightins.com. Dates are available in May. The program is easy to implement, and your school receives a check from the Fightin Phils. Season tickets for the 2017 season are available online at Fightins.com, by phone at 610-370-BALL, and in-person at FirstEnergy Stadium. Follow the Fightin Phils on Twitter at @ReadingFightins and like them on Facebook via www.facebook.com/fightins. Night of boxing from King’s Promotions set for Saturday, September 20th at 6:00 p.m.
Baseballtown will be getting ready to rumble on Saturday, September 20th when FirstEnergy Stadium hosts Fightin For Cerebral Palsy, a boxing event to benefit Cerebral Palsy. The night will feature exciting boxing matches from King’s Promotions. 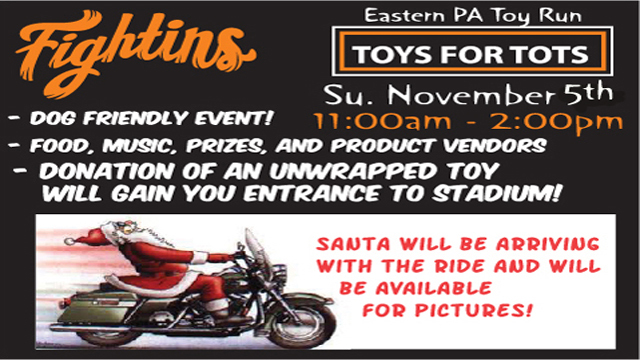 Proceeds from the event benefit Cerebral Palsy thanks to King’s Promotions. Bell time for the event is at 6:00 p.m. with Tompkins VIST Bank Gates opening at 5:00 p.m.
Ringside tickets cost $25 while general admission is just $15. Tickets are available by calling King’s Boxing at 610-587-5950. King’s Gym opened in Reading in 1995 as a way to get youngsters off the streets and involved in more positive activities. The name “KING” stands for “Kids In Need of Guidance and gym owner Marshall Kauffman has spent years using the sport of boxing as a way for both his professional and amateur boxers to feel good about themselves through confidence and pride. KING’s Promotions was formed in 1994 and has since put on many successful amateur and professional fight cards in the mid-Atlantic region. In 2005, local businessman Jeff Nigrelli joined Marshall as a partner in KING’s Promotions. They have since put on several sold-out fight cards at the Riveredge Complex in Reading and have recently expanded to boxing events at the spacious and modern Sovereign Center in downtown Reading, Pennsylvania. Fans can get more ticket information by visiting Fightins.com, calling the Fightin Phils Ticket Office at 610-370-BALL, or by visiting the Fightin Phils Ticket Office in person at FirstEnergy Stadium. Follow the Fightin Phils on Twitter at @ReadingFightins and like them on Facebook via www.facebook.com/fightins. 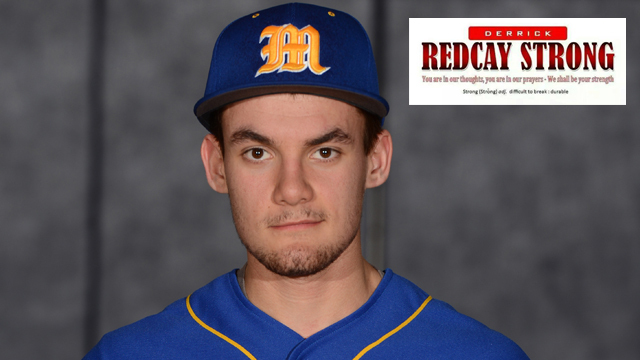 The Reading Fightin Phils and the American Red Cross invite you to donate blood In Memory of Frank Mascaro on Monday, August 11th, from 10:00am to 3:00pm. You can help J.P. Mascaro & Sons reach their goal of 1,000 pints of blood for the Red Cross by August 2014. All presenting donors receive four tickets to Reading Fightin’ Phils game on August 16th. The American Red Cross is facing a looming blood shortage leading to an urgent need for donors of all blood types to roll up a sleeve and give. Since May, donations through the Red Cross are down approximately 8 percent, resulting in about 80,000 fewer donations than expected. The number of donors continues to decline and the shortfall is significant enough that the Red Cross could experience an emergency situation in the coming weeks. Peanuts and baseball have gone together since 1908 when “Take Me Out to the Ballgame” was written by Jack Norworth and Albert Von Tilzer. For some fans a day at the ballpark wouldn’t be the same without a bag of peanuts, while others can’t even attend a game with the threat of peanut shells in the air. 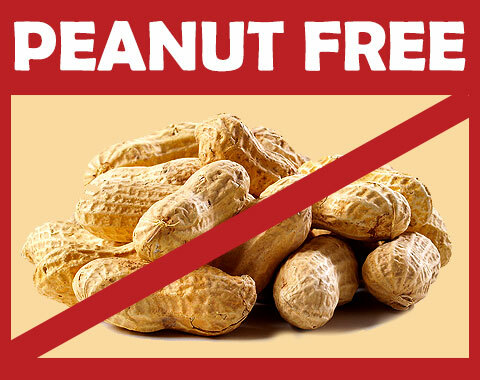 On Thursday, August 22 the Reading Fightin Phils have decided to have a food allergy awareness peanut free game to accommodate these fans. This will give fans with a peanut allergy the opportunity to watch America’s pastime live and in person. Thursday night the VIST Bank Plaza gates will open at 5:00 pm for a happy hour with $1 off beer and a pre-game concert featuring Vuja De thanks to Miller Lite. Members of the Redner’s Fightin Phils Kids Club can enjoy a happy half-hour from 5:00-5:30 pm with free Phunland. There will also be Berks Bards Poetry Contest. 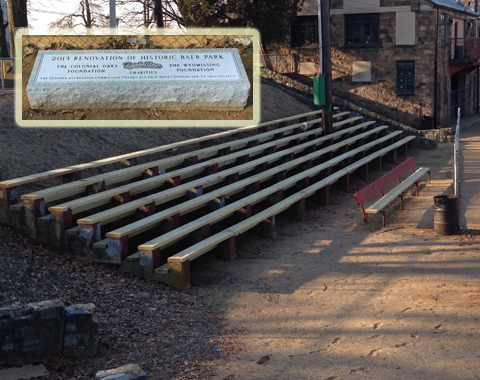 The seating bowl opens at 6:00 pm for the 7:05 pm game. There will be a post-game fireworks show thanks to Pepsi. Following the fireworks Vuja De will perform a post-game concert thanks to Yuengling. Current Philadelphia Phillies hitting coach and former R-Phils hitting coach Greg Gross is once again bringing his ALS Auction to FirstEnergy Stadium this season with a handful of great items that you won’t find anywhere else. This Saturday, May 5, the R-Phils along with Gross will once again hold this great event at America’s Classic Ballpark when the team takes on the Erie SeaWolves at 6:05 p.m. The night also features one of the first post-game fireworks shows of 2012 thanks to Carpenter Technology Corporation. During his time with Philadelphia (1979-1988), Gross began working to help fight ALS and remained dedicated to the battle. ALS is cause near and dear to the world of baseball and is commonly referred to as Lou Gehrig’s disease, named after the New York Yankees Hall of Famer who was diagnosed with the disease in 1939. Tickets for all regular season Reading Phillies home games, as well as Baseballtown All-Star Classic Events, are available online at www.RPhils.com, by phone at 610-370-BALL, or in person at the R-Phils Ticket Office located at FirstEnergy Stadium. Fans can also add the all-you-can eat Deck Buffett wristband to any order for only $12. 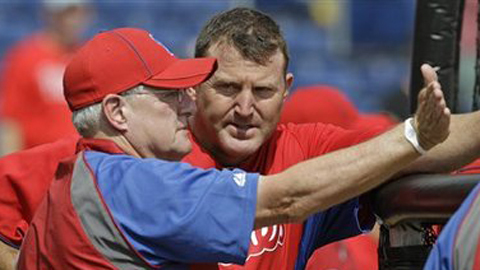 This article originally appeared on the official website of the R-Phils. 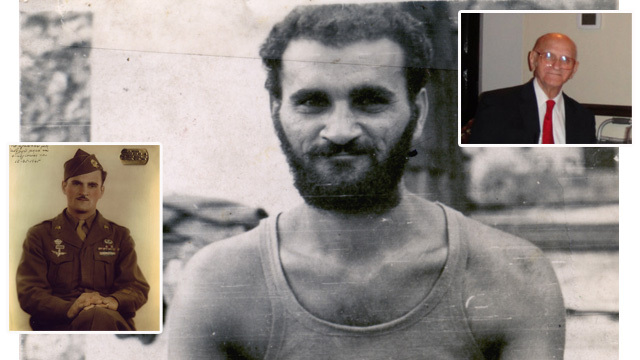 Click here to view the original story.